I never thought I'd be an open-carry advocate. However, I'm a firm believer in working within the American political system in order to change the status quo. If the Second Amendment is cherished by millions of Americans, then why not use it to further certain liberal ideals? Protecting African-American lives and alleviating tensions between the black community and law enforcement should be a top priority of all Americans and especially Congress; however, this is not the case. It speaks volumes that African-Americans vote over 90 percent Democrat during national elections, yet our future nominee in 2016 still hasn't addressed an issue the whole nation is talking about, even after Darren Wilson's acquittal and the flames that engulfed Ferguson. With all our advancements as a nation, there's still a correlation between today and 1895, the year Ida B. Wells wrote The Red Record. We live in a surreal time period where the deaths of unarmed black males still take place, even though we have a black president and African-Americans today possess more rights than at any other point in U.S. history. While rioting by a very small percentage of protestors does a disservice to the memory of Michael Brown and the cause of saving black lives or preventing future Fergusons, there are legal and more effective ways to solve our nation's moral conundrum pertaining to racial profiling, police brutality, and issues related to the deaths of unarmed citizens. No, I'm not advocating armed insurrection. My name isn't Cliven Bundy. Furthermore, I'm in no position to tell anyone how to live their lives and the ideas presented here relate to the belief that if one American community is experiencing an injustice, then it's incumbent upon all American to try and find a solution. The "perfect crime" in America should not be killing an unarmed black man and then claiming self-defense. To be clear, I'm not really a gun person. I've written before about how we'd already be fighting another major war if school shootings were done by terrorists, and how gun rights advocates are fooling themselves by furthering the notion that armed civilians could overthrow the government. I just don't see the Tea Party ever waging an effective battle against the United States Armed Forces. Furthermore, I believe the arguments promoting a warped interpretation that Hitler and Stalin committed their atrocities because of an unarmed citizenry makes a mockery of history. Propaganda relies on a distortion of history that furthers a political agenda; telling people that Hitler's rise to power was due to a lack of gun ownership is a prime example. It took the combined might of the U.S., USSR, Great Britain, and others to defeat the Nazis, so I doubt Charleston Heston's shotgun would have prevented the Holocaust or saved the globe from WWII. Hitler, Stalin, Mao, and every other monster in world history utilized insidiously flawed leaps of logic and grandiose conspiracy theories (the Nazi belief that Jews were racially inferior and caused Germany's loss in WWI) in order to brainwash their citizenry into submission. NRA talking points simply have anything to do with how the Nazis conquered Europe, or why Stalin sent millions to the gulags. A gun can protect you from a home invader, but not so much from a totalitarian regime that has duped its citizenry into scapegoating an ethnic group, or claiming that its enemies are the embodiment of evil. In short, I'm not a fan of Alex Jones-type conspiracy theories that confuse assumption with evidence. That being said, the Tea Party, NRA, and others in this country aren't wrong about everything. Within the politically charged hyperbole of gun lobbyists, there exists some truth about the benefits of openly carrying a weapon in the United States, and these benefits could perhaps help the African-American community. If the Second Amendment can help quell an epidemic of unarmed black men being shot and killed, then why not promote this alternative to the status quo? The three reasons below explain how the benefits of black men openly carrying a gun have little to do with advocating the use of such weapons, and everything to do with what displaying the gun will entail and how open-carry laws can help put an end to racial profiling and unarmed deaths. 1. Openly carrying a gun legally (in an open-carry state) is a public display indicating that an individual does not have a criminal record. This alone undermines the basis behind racial profiling. Since there's an FBI background check before the purchase of a gun, walking with a firearm in an open-carry state is essentially a public display that one does not have a criminal record. Furthermore, since the vast majority of African-Americans will never have a criminal record, then openly carrying a gun could be a sign, or a public display to everyone that an individual must not be confused with a suspect, or treated like a suspect. The death of John Crawford, an unarmed black man whose only mistake was picking up a pellet gun from the gun department at Walmart, is a prime example of why Americans should see more black men carrying firearms. The video of Crawford's murder is horrific. Yes, there are unarmed white men killed by police, but not at the rate African-Americans experience, and white skin has never correlated to suspicion in our country. 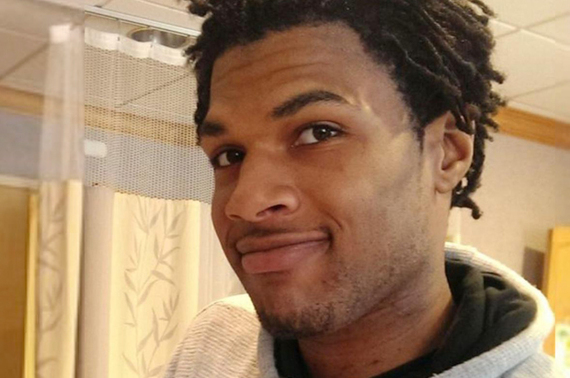 The shooting death of John Crawford inside a Walmart, especially when he was holding a Walmart pellet gun sold within the store that he picked up from a shelf, doesn't only highlight America's view of race and guns. Surveillance cameras confirmed that he was not doing anything wrong, yet he died holding a gun, in a place that sells guns. Crawford's death signifies that that the mere sight of a black man with a gun instantly equated to danger. Race played a factor in Crawford's death, as it does in the death of all unarmed African-Americans who are walking home or crossing a street. A Harvard study on race and skin color titled "The Skin Color Paradox" states "racial minorities with dark skin in the United States have been disproportionately disadvantaged for centuries." The study also highlights that Americans harbor biases against darker skin, and this bias is so entrenched that even black children share the same prejudices to an extent. There are numerous other reputable studies highlighting how issues like racial profiling result from a suspicion of darker skin color. Watch this video to see how responsible, courteous and professional police officers interact with an intelligent and knowledgeable citizen (living in a California city where the majority of citizens are minorities) and imagine interactions like this one with African-American men. Both the police and this citizen are at odds, but not in a dangerous encounter, even though guns are the focal point. This video does show a black man openly carrying a gun and this video shows many black people carrying guns while protesting police brutality. It runs contrary to the thinking of those on opposite ends of the political spectrum, but after Trayvon and Ferguson, it might be time for Americans to see more, not less black people with guns. 2. The epidemic of disproportionate force utilized against black men in America warrants an alternative, and legal, solution to this problem. The deaths of unarmed black citizens continue in America, despite the fact that we're in 2014 and not 1814. While the killers of Trayvon Martin and Michael Brown have been found "not guilty," cities throughout the country have admitted guilt in other fatal encounters with unarmed African-Americans. Often times, the stories of these tragedies are so horrific that one wonders why such overwhelming force is utilized against people who aren't carrying weapons. Eric Garner's death in July was ruled a homicide resulting from a police chokehold. He was unarmed, black, and here's the Time Magazine video of his death. Garner had just broken up a fight and was accused of selling cigarettes. This November, the City of Cleveland reached a $3 million settlement with the families of Timothy Russell and Malissa Williams. Cleveland police officers killed the unarmed black couple after firing 137 bullets at their car. In 2013, The City of Orange County agreed to pay $4.4 million to the family of Manuel Loggins Jr. The former Marine sergeant was unarmed, black, and was shot to death by police in front of his two daughters. After watching their father die, the two young girls were held for 13 hours by police for questioning. In 2011, San Francisco's BART agreed to a settlement of $2.8 million for the shooting of Oscar Grant III, after the unarmed black man was killed by a former officer. In 2010, New York agreed to pay $7 million to the family of Sean Bell, an unarmed black man shot and killed by police. It was Bell's wedding day. In 2011, five New Orleans police officers were convicted of killing Ronald Madison, an unarmed black man. Madison was also mentally disabled. In 1999, 41 bullets were shot at unarmed Amadou Diallo by four officers and New York settled with the West African immigrant's family for $3 million. This September, a former South Carolina state trooper was fired and now faces charges for shooting Levar Jones (Jones survived), an unarmed black man. This August alone, 4 unarmed black males were killed by police. In Brooklyn this month, Akai Gurley was shot and killed in the darkened stairwell of a housing project. Gurley was unarmed and his death was ruled a homicide. The other day, police shot at an unarmed black man holding his daughter, but thankfully neither were killed. There are so many more instances of unarmed black males shot by police that there simply isn't enough room in this article to continue. Therefore, regardless of your view of gun ownership, the predicament faced by African-Americans warrants a serious look at whether or not openly carrying a weapon will save black lives. 3. The vast majority of African-American men will never commit a crime, so it's time America realizes this fact. If openly carrying a gun will help our country overcome centuries of prejudice pertaining to skin color, then it's an option that should be pursued. Let's analyze Ferguson and racial profiling, not from the vantage point of those who claim a cigar thief deserved death, but from a novel approach. If the percentages indicate that one in three black males will have an interaction with the criminal justice system, and research shows that 1 in 15 are incarcerated, then this also means the vast majority of black males will have zero interaction with prison, crime, or anything to do with America's criminal justice system. These statistics also mean that 75 percent won't have any trouble with the law and that 14 in 15 African-Americans are NOT incarcerated. Basic math always destroys racism, and although the statistics are horribly skewed against African-Americans (which contributes to laws like stop-and-frisk, or shooting of unarmed citizens), they also show that the majority of black males are peaceful, law abiding, and deserve to walk home without being followed by George Zimmerman. A big problem in America is that the image of a black male becomes malleable depending on the polarizing media blitz and vapid justifications defending the deaths of unarmed citizens; a figment of our nation's imagination, where a violent behemoth shoplifting little cigars and walking in the middle of the street deserves the guillotine. Likewise, most cops are good people who have enough training and common sense not to turn a traffic stop into a deadly encounter, even if things don't go exactly there way during the interaction. I have the honor of knowing several police officers in Los Angeles and I believe that most officers risk their lives to protect people, not to intimidate or harass anyone. However, when 27.4 percent of African-Americans live in poverty, and poverty correlates directly to crime and violence, then too often you get the Darren Wilson's of the world. Finally, there's simply no reason why the vast majority of an ethnic group in this country should have to pay for the sins of a smaller percentage of their community. Open carry is legal in most states, most black men will never commit a crime, and all American lives are precious. Therefore, if carrying a weapon will serve a sign to others that a particular citizen has never been in trouble with the law, that he or she should be addressed with courtesy and respect, and that this citizen could protect himself if his constitutional rights are violated, then why on Earth don't we look at this option?